If you live in Luzerne County, it’s snowing! I love the winter and didn’t expect to see snow anytime soon. We all know snow can be nice and it can keep us from getting to work or classes. Today, the snow isn’t hard enough to interfere with our everyday lives, but we can start getting our winter reading list together. Trust me, if the power goes out, you’ll need something to do. Reading can be a nice escape from the chaos. From November to March, you’ll be seeing books added to our winter reading list! Today, we will start with Demise of the Spirit’s Guiding Lady. Back in September, I met a talented young author named Megan Redlich. A school project turned into her first published short story and manga. From right to left, the book starts as a short story. From left to right, the book becomes a manga. Manga’s are japanese comic book that are enjoyed by people of all ages. Ms. Redlich’s book falls under fantasy, mystery, and comedy because it involves mystical creatures, a writer’s mission to discover the truth, and his humorous way of documenting his journey. Demise of the Spirit’s Guiding Lady follows the journey of a cowardice writer who renames himself Animus. A terrible unlikely shipwreck leaves Amimus alone. Unfortunteally, he is not of this world…kind of. Animus realizes that he is not able to connect and speak with people who makes him a member of the supernatural. As much as he’d love to move on, he is trapped on earth with unresolved issues. He must go forth and find out what happened to the Spirit’s Guiding Lady. As he uncovers clues to his demise, he records his journey in his book. I enjoyed this manga because I love the japanese culture. Before relocating to Pennsylvania, I went to school in New Jersey. There I took one year of japanese. Sadly, my new school didn’t have japanese in their curriculum. So, I had to take spanish. Regardless of where I lived, I always watched anime, read mangas and enjoyed japanese entertainment. When I had the opportunity to read Ms. Redlich’s book, I jumped on it. This is the first time I’ve met the face behind the book. Yes I am Facebook Friends with Ellen Byerrum, Dimitri Sarantis Author, and JH Bográn, but I haven’t had the pleasure or opportunity to meet them face to face. Needless to say, it was cool and surprising to see that she was so young. There are many up and coming writers that wish they published a book before graduating highschool. Demise of the Spirit’s Guiding Lady is not a typical story. It is unique and humorous. Overall, the story was a quick read full of puns, action, violence, and humor. It is perfect for a snow day in. Plus, if you don’t want to read it in manga from, you can read it like a book on the flip side. Adding this portion was thoughtful and considerate of Ms. Redlich. 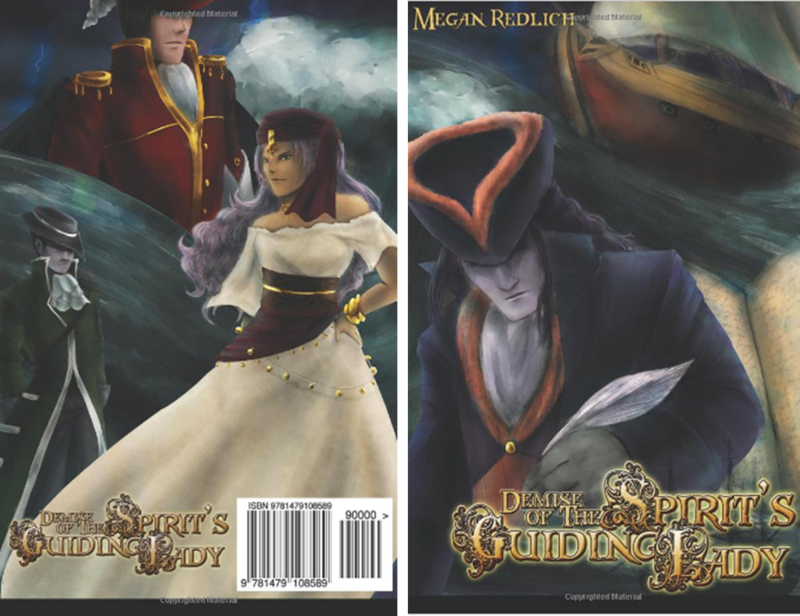 If you decided to read Demise of the Spirit’s Guiding Lady, I suggest you add the book to your GoodReads account! If you like my reading list, we should connect! Want your own copy? You can get it from Barnes and Knobles or Amazon. Megan does more than right books. 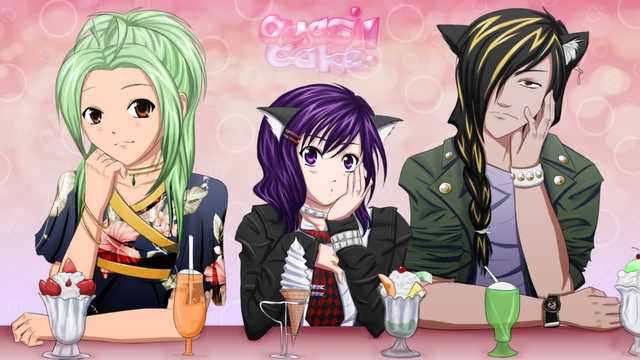 She also has a website called Quasi Cake! Here you can learn more about her style and what inspired her to become an artist and writer today. Plus, you can read more of her mangas for FREE! In addition, you can purchase Quasi Cake merchandice! If you still haven’t had enough of Ms. Redlich, you can read articles about her on her family’s blog Clamco! Stay warm and read! It’s enlightening and entertaining. I love the new bold silhouette look on your blog!